Today's preach by Pastor christie was full of messages that embarked everyone's heart. It was main pointed to the verses from 1 Kings 17:1-16. At times, we feel the emptiness in one of the aspects of our life and we react on it in different ways. The overall idea was "Where God leads you, He will provide for you". Indeed, let Him lead us into His ways and we should be assured that everything that we need will be dispensed by Him. In 1 Kings 17:6 (The ravens brought him bread and meat each morning and evening, and he drank from the brook), it showed here that in our life, we may feel full of blessings, full of wonderful things that surround us, everything is perfect, everything is in a smooth flow. Since we are comfortable in such kind of situation, He may give us some challenges, He can dry up the supply and pull us out from the comfort zone. Then in 1 Kings 17:7 (But after a while the brook dried up, for there was no rainfall anywhere in the land), Elijah's supply was cut out and the Lord tried to challenge Him and asked him to follow His commands. Sometimes we feel that after a sustainable status, He will just get it out from us. We shouldn't take such instances as a punishment, instead, we should be thankful as these obstacles will make us stronger and be assured that better things are coming and just trust His plans. The Lord then instructed to Elijah in 1 Kings 17:8-11 (8 Then the Lord said to Elijah, 9 “Go and live in the village of Zarephath, near the city of Sidon. 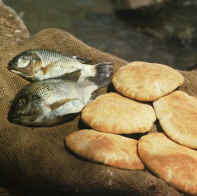 I have instructed a widow there to feed you.” 10 So he went to Zarephath. As he arrived at the gates of the village, he saw a widow gathering sticks, and he asked her, “Would you please bring me a little water in a cup?” 11 As she was going to get it, he called to her, “Bring me a bite of bread, too.”), indeed He gave a supply to Elijah. We are reminded that we just need to follow His every words as He is the Great Provider, His love to us unlimited, limitless and no boundaries. As long as we believe Him, we trust Him and commit everything to Him, we are in the right path and nothing can go wrong. In 1 Kings 17:14 (For this is what the Lord, the God of Israel, says: There will always be flour and olive oil left in your containers until the time when the Lord sends rain and the crops grow again!”), there will always be supply of blessings from Him. This main message was also mentioned in Philippians 4:19 (And my God will meet all your needs according to the riches of his glory in Christ Jesus), He will give ALL of our needs. For every challenges that we face, we should stand up and be reminded that He is bigger than those problems. If we feel empty, only He can fill us up, surrender everything to Him, believe in Him. Wala na bang new posts?